It’s overwhelming choosing what variety of seeds you want to plant each year. Every spring I look at the array of varieties of carrot, tomato, basil, cauliflower, to name just a few. I remember back in the day when there wasn’t much more than 2 or 3 types of tomatoes to choose from, and about the same for carrots. Today I’ll compare carrots. The length of each type will help you decide which to plant, especially if they are to be grown in containers. The chart below will also help you decide which variety to plant during different seasons. Now that you can see how they look, keep reading to learn how they taste. Of course, words don’t do them justice, but it’s a start. I’m showing the days to maturity but you can always cheat if you can’t wait. Nelson – This has long been a favorite because of it’s sweetness. They are very crisp and tender. 56 days to maturity. Mokum – This is another early favorite. Also about 6″ in length, the Mokum is more slender the the Yaya and Nelson. Crisp and sweet. 54 days to maturity. Napoli – The Napoli is best for a winter harvest. They do especially well in winter greenhouses. About 7″ long they are said to mature in 58 days but may be a bit longer if the weather is cold. Hercules – True to their name, the Hercules adapts to difficult growing conditions. Performs well in rocky, shallow or heavy soil. 6-1/2-7″ long, they are a tasty summer and fall harvest. 65 days to maturity. Vitana– This carrot has a mild and sweet flavor and can grow well in the heat of summer. They are equally flavorful as babies or full grown. 65 days to maturity. Bolero – A longer variety at 7-8″, this French carrot is thick and blunt. It’s a favorite for fall and winter harvest because it stores well. It has a good, fresh flavor. 65 days to maturity. 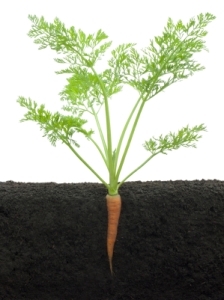 Nectar – Getting longer now, the Nectar carrot grows to an average of 8″. They grow very straight and uniform. Usually producing a high yield they are very flavorful. 72 days to maturity. Sugarsnax – Tender and sweet, the Sugarsnax is high in beta-carotene as evidenced by the deep color. Smooth and long (9″), they grow uniformly. 68 days to maturity. Watch for more posts that compare varieties of fruits, vegetables and herbs. Hope this helps.